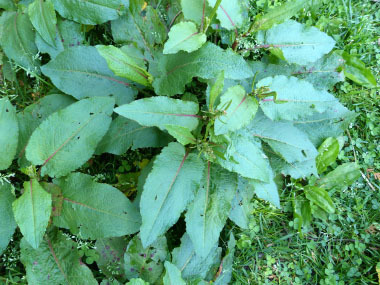 Bitter dock is a perennial herbaceous plant that is found in many countries. 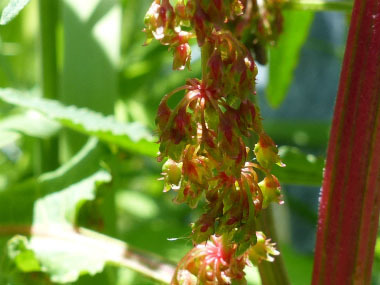 It is a member of the Polygonaceae (buckwheat or dock) family. This plant has a long taproot that enables it survive long drought periods and out competes other vegetation. Although bitter dock seedlings find it difficult to flourish under competitive conditions, fully grown plants are able to endure being trodden over and mowed. Shortly after this plant has been trampled or mowed, it sends up new shoots and frequent rejuvenation may even result. 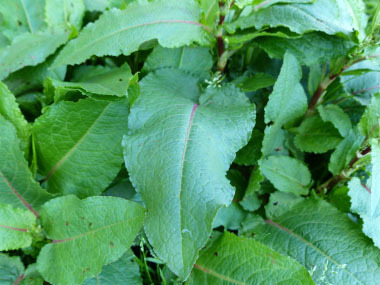 During winter months, bitter dock coils up having undersized shady leaves and a solid taproot. Once the cold temperatures have ended, bitter dock quickly produces new leaves. Distinguishing Features: This plant is easily recognizable by its broad, oval leaves with cordate bases and rounded tips. Some of the lower leaves have red stems. The edges of the leaves are slightly wavy; and the upper surface is hairless. If this plant is seeding, a close examination will show that the seeds have sharp points (or spines) on the edges of its fruit's wings. Flowers: Flowers bloom (in the northern hemisphere) anywhere from June to October and the seeds ripen from July to October. Bitter dock flowers are hermaphrodite and are wind pollinated. Flowers appear as branching clusters at the top of the plant, each branch with numerous whorls of 10 to 25 slender-stalked flowers. Flowers measure about 3 to 6 mm (1/4”) long, and are light green to pinkish. There are six stamens, the pistil has three fused carpels and it has three styles. 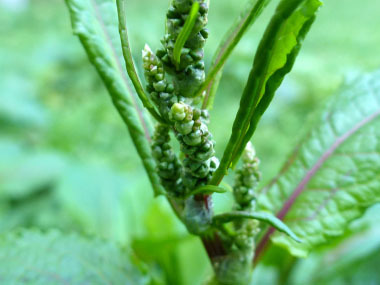 Fields of Nutrition has medicinal benefits and vitamin/mineral content of Bitter Dock. 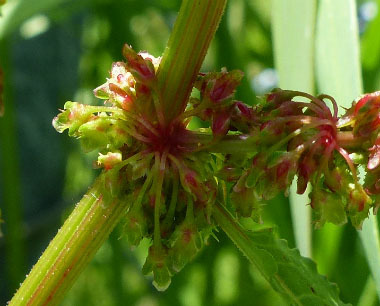 Leaves: As the bitter dock emerges it consists of a rosette of basal leaves, from which one or more flowering stalks develop. Basal leaves grow up to 30 cm (1') long and 10 cm (4") across. Petioles are long and slender, while their blades are oblong-ovate, slightly undulate along the margins, and glabrous. Bitter dock's central vein of each basal leaf inflorescence is often tinted red, and a reticulated network of fine secondary veins is seen across the upper surface. The leaf base is slightly cordate or well-rounded, rather than tapering or wedge-shaped. Leaves are alternate along the flowering stalks. They are similar in appearance to the basal leaves, although somewhat shorter in length and more narrow and their petioles are shorter. Height: This herbaceous plant usually grows between 60 and 90 cm (2-3') tall. 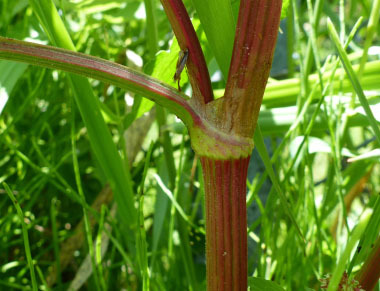 The stalks are round, slightly ribbed, and glabrous; they often have prominent longitudinal veins that are tinted red. Each stalk terminates in a panicle of whorled racemes up to 30 cm (1') in length. Habitat: Bitter dock grows in a variety of areas but tends to prefer shady areas with moist soils. It grows in woodland area, meadow edges and alongside creeks. This plant prefers pH balanced soils although it can grow in very acidic and very alkaline soils as well. It grows at altitudes up to 2,300 metres. 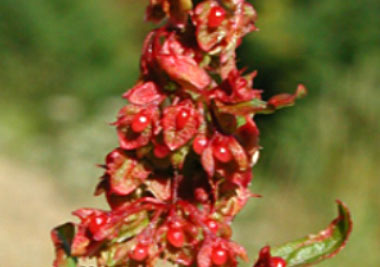 Bitter dock is native to many areas or Europe, Asia (including Japan), and Greenland. It was introduced to Canada and the United States. It was also introduced to many areas of Central America, South America, Australia (including Tasmania), and New Zealand. 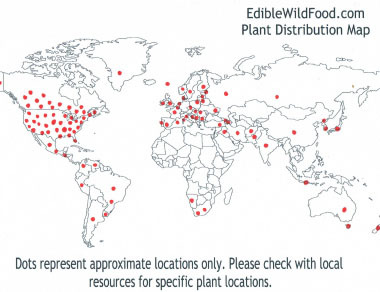 Bitter dock also grows in hot climates such as South Africa, Namibia, Iran, Iraq, Indonesia and India. 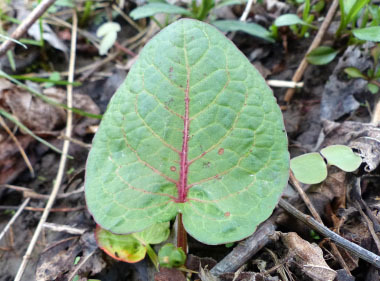 Edible parts: Young leaves are edible fresh or cooked. These leaves do have a bitter taste, especially the older they become. Some people will cook leaves in at least one change of water in order to reduce the bitterness. They can also be dried for later use. Young stems can be consumed as well but are preferred cooked by those who enjoy them. Seeds can be used raw or cooked. Like yellow dock, the seed can also be ground into a powder and used in baking although it is more time consuming to harvest. 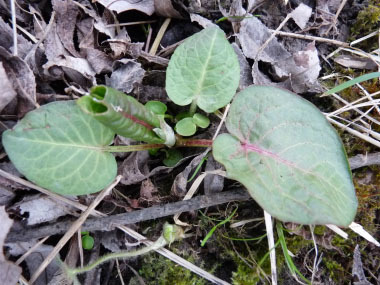 Other name: Round Leaved Dock. 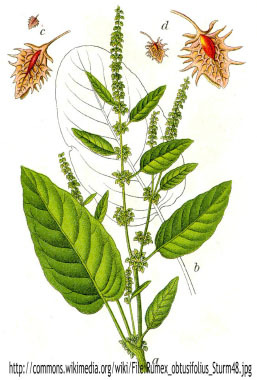 Similar plants: Yellow Dock, Nepal Dock.